A bus stop can be a pole with a sign on it. Or it can be something safe and inviting. The city of Albany figured out a way to make a bus stop way better–they combined it with a parklet (see lead photo and below). Stephen Newhouse, who now works for Vancouver, Canada’s transit agency, helped put the project together during his time as a planner with AC Transit. He said transit agencies generally don’t control the right of way, so it’s hard to provide nice bus stops. But “by leveraging public enthusiasm for parklets, transit agencies can achieve priority measures (namely, bus bulbs) with little or no opposition at a fraction of the cost,” he wrote in an email to Streetsblog. As Newhouse explained, this parklet was funded by a Safe Routes to Transit (SR2T) grant and a Kickstarter campaign. “The Kickstarter raised $20,000. AC Transit contributed $25,000 of the SR2T grant for construction,” he wrote, adding that the remaining funds are going to develop guidelines for future parklet bus stops. Meanwhile, Oakland is experimenting with its own bus stop improvements, on Telegraph Avenue. 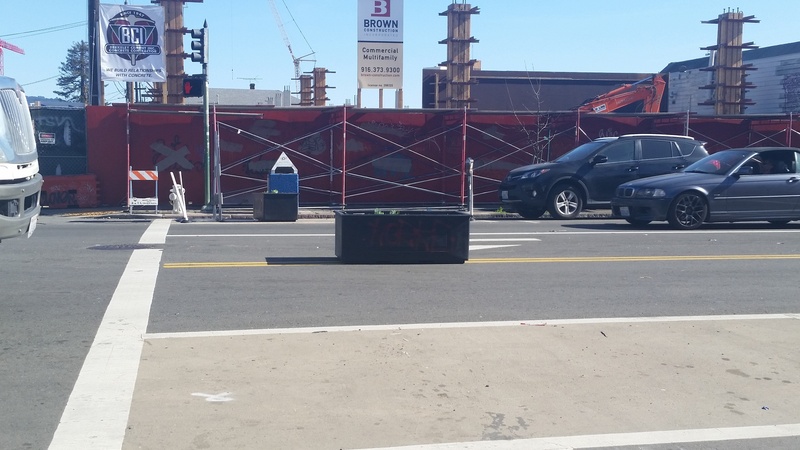 Telegraph is the location of Oakland’s first parking-protected bike lane. However, from the day it opened, there was a problem with bus and bike interactions, since buses still had to cross the bike lane to access the curb. As a result, cyclists and buses have to jostle around each other at every bus stop, creating a nerve-wracking and dangerous condition. Oakland plans to install concrete bus-boarding islands, similar to the ones installed in SoMa in San Francisco, when funding becomes available. In the meantime, they are experimenting with plastic bus-boarding islands. There are two sets of bus stops in the project area — at 24th and at 27th Streets. Currently, buses pull through the painted buffer zone and bike lane to pick up and drop off passengers. This is an interim condition. The islands are built by Zicla, a company in Barcelona. PeopleforBikes has a great post that breaks down how and where they’re used. As of Friday, however, the boarding islands on 24th are nowhere to be seen. Streetsblog has a request in to find out why and will update this post accordingly. Also, the northbound bus boarding island on 27th was blocked by a crew working for AT&T–even though they weren’t digging in the bike lane. Streetsblog asked the foreman why the “Share the Road” sign and some of the traffic cones were placed in the middle of the bike space. This highlights an ongoing problem throughout the Bay Area–construction lane-closure guidelines need updating–badly. According to the Medium post, OakDOT will be doing a “before/after” study of how people respond to the bus boarding islands. Let’s hope the study authors will make note of the fact that only one of the four is actually there and fully available for cyclists. Meanwhile, OakDOT also put down 60-some planters to help delineate and protect the bike path. It seems to work–no scofflaw parkers on the bike lane today! That may be a first for the Bay Area. I am full of hate for those Telegraph bus islands. They’re just too abrupt, and in the morning rush hour they are too narrow to accommodate all the bike traffic. To generalize, the cost of creating well designed stops stems from neighborhood resistance, and the key to keeping costs in check, something that benefits all city residents not just those who use public transportation, is being creative in circumventing, discharging or diffusing it, which is to say that the public feed back process is actually detrimental to public transit. That underlying problem is one that should addressed directly. – When I first moved to SF, a few years ago now, it took me several attempts before I rode the bus for the first time because I couldn’t figure out where to wait for the bus to board it. I think that the current sign upgrade currently being built out across the city is a bigger deal than many people realize with respect to the usability of our bus system. The planters are not quite heavy enough to prevent drunks from testing their strength by pushing them. A bunch have ended up in the bike lane or parking spaces. So, not a 100% win. Will we ever be a civil society? This is one of many reasons we cannot have nice things – too many knuckle-dragging idiots. Re: Telegraph’s boarding islands, I heard that they only installed one set because not all the right parts got shipped so they needed four to make two that functioned. I think these are great, but to be the fast implementation solution needed, the city has to already have parts in house – it took more than 1.5 years from initial implementation of the bikeway to get these rolled out at one set of stops. I also have noticed that on a sunny/hot day, they don’t leave much (anything) in the way of shade. When I walked by the 27th one, i saw two people waiting for the bus, one on the island and the other under the shade of a nearby building’s overhang. Re: Telegraph planters, I totally agree with @jefposkanzer:disqus . I pass by regularly and the planter boxes are never in the right place. It is clear people driving are moving them out of the way to continue parking in the beige area. I have even seen one in the middle of the street creating a traffic hazard (which i promptly reported and which was removed) -photo attached https://uploads.disquscdn.com/images/cad19688546e6d735b79edd693441bee5acd230466c9f83c8d6a6a75387b072d.jpg .